Looking for something fun, active, and educational for your child to do during the school break? Sign them up for Great Hollow’s Spring Break Adventures Program! Our popular program offers children ages 5 to 9 the opportunity to get outdoors and experience the natural world on our beautiful 825-acre preserve. 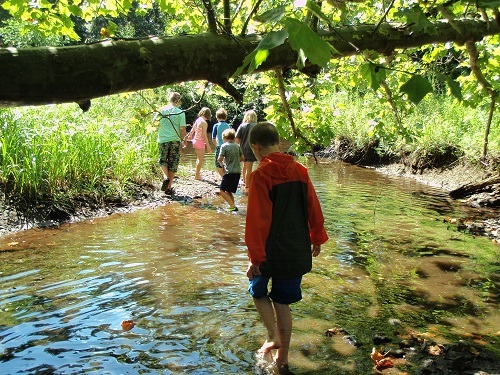 We’ll explore Great Hollow’s streams, forests, and fields, learning all about these ecosystems and the special critters that call them home. Each full-day session includes science-based environmental education activities, games, hikes, live animal encounters, and time for self-directed nature play. See below for daily themes and topics. Join us for one day, two days, or the entire week! Members: $45/day for one day or $40/day for multiple days. Non-Members: $50/day for one day or $45/day for multiple days. Drop-off is at 8:30am and pick-up is at 3:30pm. Please contact our Education Coordinator, Sena, at gro.w1555592117olloh1555592117taerg1555592117@anes1555592117 or (203) 546-7789 with any questions or to register your child. Space is very limited. Monday, April 16: Solve it with STEM! Calling all scientists! Spend the day completing increasingly complex STEM (science, technology, engineering, and math) challenges related to the natural world. We’ll learn, then practice, the scientific method and engineering design process as we tackle challenges such as building a bird nest that can protect a falling egg; designing and building a stick tower that can hold a fist-sized rock on top; building a rock bridge across a creek; and designing a shelter to protect a UV-sensitive animal from the sun. Join us as we spend the day creating nature art masterpieces of our very own, ala Andy Goldsworthy, Richard Shilling and Clare Walker Leslie. We’ll start the session off by making blank books out of recycled materials and learning the basics of nature journaling. Then we’ll venture out onto the grounds to begin our land art projects. As these creations are ephemeral and can’t be taken home, several pictures will be taken of you with your work which will be emailed to your parents at the end of the week. Wednesday, April 18: FBI Investigations—Fungi, Bacteria, and Invertebrates! It’s a tough job breaking down all the dead things in the world, but something has to do it! Enter nature’s FBI—the fungi, bacteria, and invertebrates that sustain life on our planet by breaking down organic materials and turning them into soil. We’ll search Great Hollow’s trails for examples of the FBI in action, or evidence of the work they left behind. Along the way we’ll learn the basics of nutrient cycling, decomposition, and energy flow in the forest ecosystem. If you’ve ever wondered why male dogs pee to mark their territories, how bees tell each other where the flowers with the best nectar are, or what frogs are saying to each other when they sing at night, then this is the program for you! After learning about the four types of communication signals animals use every day in the wild to help them survive (visual, auditory, tactile, and chemical), we’ll test some of them out for ourselves by doing a variety of activities, such as marking territories with different scents to see if we can recognize our own; dancing out the directions to a tasty treat; and attempting our own chorus of frog calls. Get your hands dirty and your feet wet as you explore Great Hollow’s streams looking for signs of life. Through hands-on activities and games, campers will learn about the water cycle, how to identify a variety of stream organisms, the importance of healthy stream ecosystems, the role beavers play in creating them, and things we can do to protect our local waterways.